On Sunday evenings in Phnom Penh, all roads lead to Diamond Island. By sundown, traffic along the routes to Koh Pich, as it’s known in Khmer, is gridlocked with USD70,000 Range Rovers and USD150 Daelim motorbikes. The drive to the island passes some of modern Cambodia’s dazzling new temples. One entrance to the 100-hectare island borders NagaWorld, a casino with video billboards whose glare can be seen from the stilt houses and dirt roads on the other side of the Mekong River. Another falls under the shadow of The Bridge, a newly completed 45-storey, USD300 million luxury condominium project that has the distinction of being the second-tallest building in the city. A third sits near Aeon Mall, where teenagers guide elderly grandparents up their first escalator. Koh Pich inspires its own kind of awe. In architecture, atmosphere, and infrastructure, it seems to take inspiration from everywhere but Cambodia. The island features a towering replica of Paris’ Arc de Triomphe, a neoclassical City Hall fronted by dolphin statues, a carnival with bumper cars and a haunted house, streets named after Ivy League universities, a bar that serves cocktails out of baby bottles and syringes, and a convention centre where Prime Minister Hun Sen regularly uses university graduation ceremonies to dress down his critics. 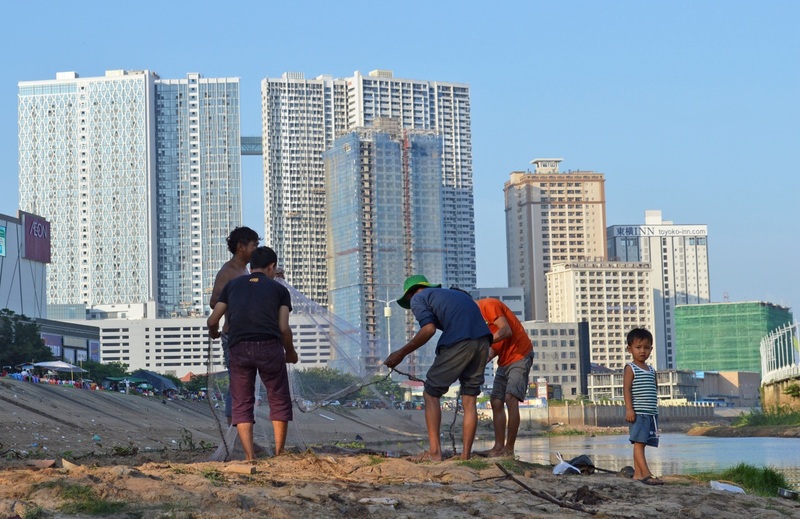 The island’s singularity has not been lost on Phnom Penh’s roughly two million residents, many of whom live in cramped conditions in the city’s mushrooming periphery. They come for Diamond Island’s neon-hued novelty and rare public spaces: its riverwalk for family strolls, its fat roads for teenage motorbike cruises, its parks for cheap dates of barbeque and beer. Over the last decade, Koh Pich has transformed from a spit of marshy farmland to a towering symbol of Cambodia’s lopsided development. 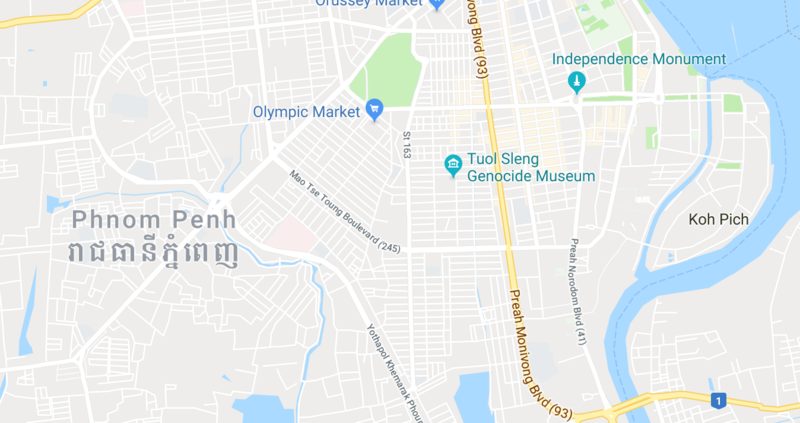 When developers first proposed changes to the island in 2004, central Phnom Penh was a low-slung capital known for its crumbling colonial villas and simple Chinese shophouses; some of its side streets hadn’t been resealed since the 1960s. The country spent decades recovering from the doomed agrarian experiments of Pol Pot and the ensuing civil war, which continued in bursts until the Khmer Rouge put down arms in 1998. According to the World Bank, 54% percent of the country still lived in poverty as late as 2004. The investment is especially dramatic on Diamond Island. The island’s developer, Overseas Cambodia Investment Corporation (OCIC), hatched plans with the government to develop Koh Pich in 2004, paying off residents with cash, land, rice, and fish sauce, according to the Phnom Penh Post, and evicting a few who refused to leave. OCIC has since set to work transforming the site into a sprawling collection of luxury housing and retail developments. Sales of the units on the island are booming. As of mid-November, sales representatives at the 33-storey Casa Meridian said they had only a dozen of its 512 units—priced between USD135,000 and USD285,000—available for sale. At D.I. Riveria, a five-tower project modeled after Singapore’s Marina Bay Sands, investors from China, Taiwan and Japan, as well overseas Cambodians, have already snapped up 90% of units, priced up to USD700,000, in the first building set for completion early next year. Kun’s vision of progress is blueprinted into Koh Pich, where names like Elite Town and Elite Road make no bones about their target demographic. Cities across the world are grappling with extreme inequality, but there are few places quite like Phnom Penh, where Maserati-driving elite pass noodle vendors surviving on a few dollars a day. Cambodia’s per capita gross national income was just USD1,302 in 2016. If Koh Pich’s rise suggests a new prosperity, its backstory of evictions, cheap labour and preventable tragedy also hints at the costs of getting there. That evening, hundreds of the workers stream from the island to the tin barracks where they live in makeshift dorms. The men and women appear exhausted and are cautious in front of reporters; wages in the industry hover around USD5 to USD7 per day for unskilled labor and most don’t want any trouble. But Suos Piseth, a 40 year-old migrant who has spent three months constructing one of Koh Pich’s towers, interrupts a shy colleague. “I don’t want to see many Cambodian workers here,” he adds. The four water ways that converge and branch out from Phnom Penh have a knack for spitting up and swallowing land mass. Steven Boswell, who authored the local historiography King Norodom’s Head, places a short-lived 17th century royal capital on a now-submerged island called Koh Slaket near Koh Pich’s current location at the mouth of the Bassac River. When Cambodia declared independence from France in 1953, Koh Pich literally wasn’t on the map. Longtime residents remember Koh Pich as little more than a gathering of sand that began accumulating alluvial silt in the 1960s. Farmers and migrant Vietnamese fishermen settled on the island after the fall of the Khmer Rouge regime in 1979. Boswell’s Cambodian wife, Ham Dany, said Koh Pich was a no-go for many city residents, who feared what might be lurking in the darkness of the island’s tall grasses. According to Boswell, residents reached the city in small canoes. In 2004, the OCIC sent Hun Sen a proposal to bring massive change to the island. Plans called for infilling the marsh and adding a 600-meter observation tower, university, hospital and high-rise office and residential developments, the Phnom Penh Post reported. Later plans added a 555-meter tower that would have topped any in Asia, though this has yet to come to fruition. (Different developers have since announced plans for a 133-storey twin tower project at an adjoining site that will be among the tallest in the world). The government approved the plans and OCIC and local authorities told the 300 or so families on the island they had to leave. The Phnom Penh Post reported that the farmers accepted buyouts at as little as a tenth of the market price and took plots of land on the outskirts of the city; the farmers who talked to the press felt as if they had no other choice. Larger landholders fared better; a few even became rich. In February 2006, military police armed with AK-47s and shotguns stormed the island and kicked out the last three families. The soldiers attempted to capsize the boats of journalists, attorneys, and NGO workers who looked on, according to the Cambodia Daily. Yeng Virak, former head of the Community Legal Education Center which worked with the farmers at the time, says the remaining families took their case to court and lost. The government and OCIC argued that the farmers were squatters on state land and had no land titles—a common and convenient position for the powerful to take given the Khmer Rouge’s destruction of property records during their rule. By the standards of Phnom Penh property development, this process was cordial. Housing rights organisation Sahmakum Teang Tnaut (STT) identified 77 eviction sites across the city by 2011, involving many thousands of residents. Though the government and developers often argue that evictions are necessary to promote economic growth, a report released by STT last year found that only a third of the sites have shown any sign of construction, and the vast majority of evictees reported getting little to no compensation. Evictees were sometimes put up in relocation sites upwards of 30 kilometers from the city centre. As central Phnom Penh has gentrified, lower and middle class Cambodians have been pushed farther and farther from the city’s core. Unremarkable houses in central neighborhoods like Boeung Keng Kang come with price tags clearing USD3 million—enough to buy a Tribeca loft or a refurbished two-bedroom in Notting Hill. The small but growing middle class have found more reasonably-priced places farther out. Phearum says he paid about USD70,000 for his house 10 kilometers from the city. He was able to afford it because of his relatively well-paying NGO salary, but others are not so fortunate. City Hall spokesman Met Measpheakdey says citizens should alter their expectations rather than blame the government for the housing prices charged by private developers. It takes about 45 minutes in light traffic to reach Khat Chhorn’s house from Koh Pich. The most direct route, along Veng Sreng Boulevard, passes through a dusty urban oblivion of factories, repair shops, and convenience stores. The area houses many of the city’s thousands of garment workers, most of whom live in crowded dorms. On January 3, 2014, the street turned into a fiery battlefield when hundreds of military police armed with AK-47 assault rifles opened fire on protesting workers who had blockaded the street. Five people were killed and dozens more injured in what rights groups called the worst state-sponsored violence since the 1990s. Chhorn lives several blocks away from a factory, in a room he shares with his daughter, son-in-law, and grandson. The concrete floor of the space is covered in blue tarp and a banner advertising a nearby school. Paint fumes from the motorbike detailing shop on the ground floor occasionally reach the room, but Chhorn doesn’t seem to notice. 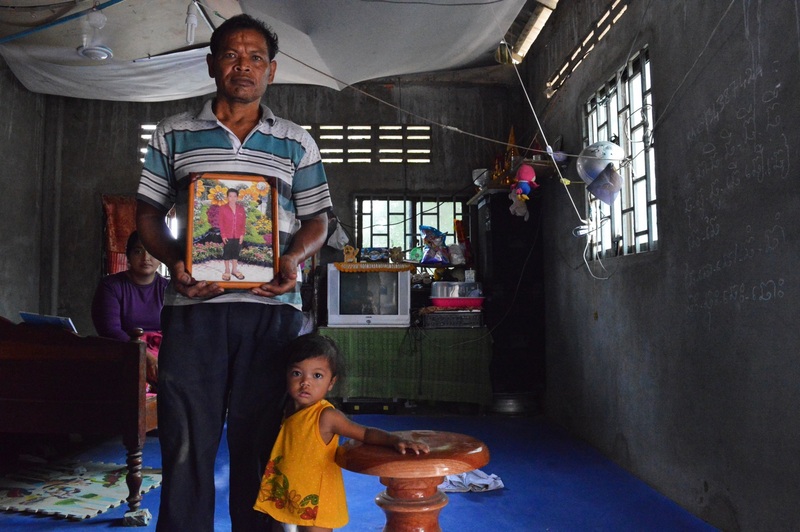 The family moved into the space shortly after his youngest son, Chhoel Chhat, was killed and two of his other children, injured, in one of the worst tragedies in modern Cambodian history. The accident, which occurred on a bridge to Koh Pich, destroyed the 53 year-old’s marriage and robbed him of his peace of mind. Today he won’t go near the island. On the morning of November 22, 2010, Chhorn caved to his 12 year-old son’s pleas and allowed him to join his brother and sister in downtown Phnom Penh for the Water Festival, a three-day event that revolves around boat racing along the Tonle Sap River. Hundreds of thousands of people go to the festival, and Chhorn was worried about his son’s safety in the crowds. “He was too small to go there,” Chhorn says. That afternoon, the siblings set off for a concert on Koh Pich. They were just starting to cross the bridge when a commotion broke out on the other side, sparking panic. Chhat’s brother Aun hoisted his sibling onto his shoulders, but the force of the crowd toppled the pair over. Aun lost consciousness. He awoke in pain but dragged himself up to find his brother and sister. Both were badly injured and ambulances, caught up in the chaos of the stampede, were slow to arrive. At the hospital, a doctor told Aun that they were busy with urgent cases. Chhat died in his brother’s arms. Chhorn says his daughter Chanthy survived but sustained her own serious injuries. The stampede claimed 353 lives in all, a tally Hun Sen described as the worst loss of life on any single day since the fall of the Khmer Rouge in 1979. The government and OCIC initially blamed each other for the accident, and Cambodia’s opposition party called for an independent investigation. The only investigation conducted by authorities ultimately concluded that the stampede had been sparked by panic that the suspension bridge was about to collapse. Victims were paid compensation—Chhorn received about USD12,000 from various sources—and the case was closed. Few expected more from a government that rarely delved too deep into unexplained deaths. Measpheakdey, the City Hall spokesman, says the government had done everything it could to aid healing from the accident, including an annual blessing ceremony held for family members. Since the stampede, authorities have increased security at the Water Festival to prevent accidents, he says. This increased security was on full display during the 2017 festival, with military police and members of Hun Sen’s personal bodyguard unit stationed with Chinese assault rifles at intersections across the city. Their presence came at a tense political moment, with the Supreme Court on the cusp of dissolving the opposition Cambodia National Rescue Party (CNRP). The party nearly unseated Hun Sen in the 2013 elections, and seemed poised to do so in next year’s vote. The dissolution, approved by the Supreme Court on November 16, followed a several months-long crackdown that has seen independent media shuttered, politicians jailed, and NGO workers surveilled and harassed. The government sees the crackdown as a small price to pay for peace and economic stability. “To protect the peace for millions of people, if necessary, 100 or 200 must be eliminated,” Hun Sen said in June. Against that backdrop, City Hall now sees the Koh Pich stampede as another example of the anarchic possibilities of large gatherings. In the 1960s, Phnom Penh’s garden thoroughfares and modernist Khmer architecture made it among the most pleasant capitals in the region. Then-Prince Norodom Sihanouk ruled the country with an iron fist but also built some of the country’s first public schools, universities, and hospitals. Driven by an expanding middle class, Phnom Penh turned into a cultural hotspot. Architects, bands and filmmakers borrowed and recast Western influences, creating novel genres of music, buildings and art. Set against the savagery that followed, the era is now remembered as a cultural golden age. 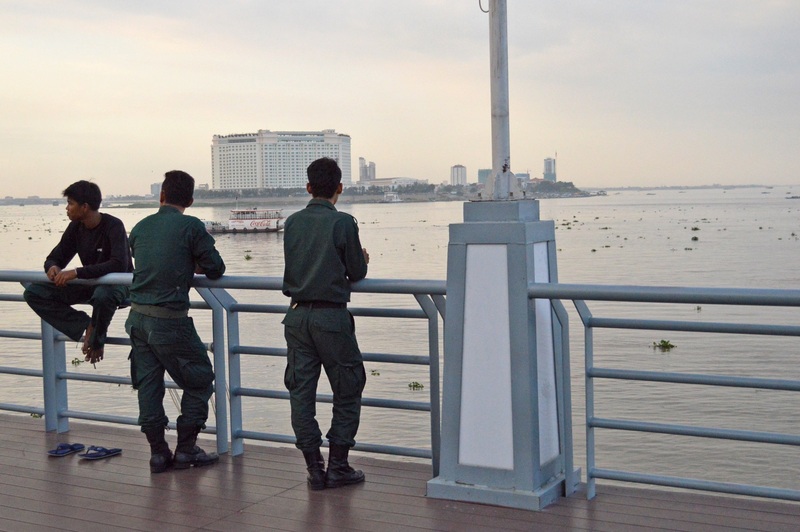 Phnom Penh’s upward skyline and economic growth have rekindled a guarded sense of a city on the rise. The capital feels young; UN statistics show that almost two-thirds of Cambodians are under the age of 30. A small but visible middle class has emerged, drafting architectural plans in coffee shops lit with hanging bulbs and dancing to Korean pop and Justin Bieber in Wat Botum Park. For foreigners living in the capital, the youthful energy can be contagious. French filmmaker Davy Chou, whose grandfather was a leading producer during Sihanouk’s reign, saw cinematic potential in the moment, but it wasn’t until he set foot on Koh Pich in 2013 that his film came together. “Everything I wanted to convey, explore, portray, was somehow here on Koh Pich,” he says. The island’s concentrated ideas of what modernity should be, its visible social chasms, “the gigantism and kitschism of the place itself” had obvious big screen potential, he says. Chou’s Diamond Island debuted last year. It follows Bora, a young Cambodian who moves to Koh Pich as a construction worker only to an encounter his inexplicably wealthy and estranged older brother. As he is presented with new opportunities—a girlfriend, a new job, a shot at going to the US—Bora sifts through the murkiness of young manhood, settling into a mood between hope and alienation. 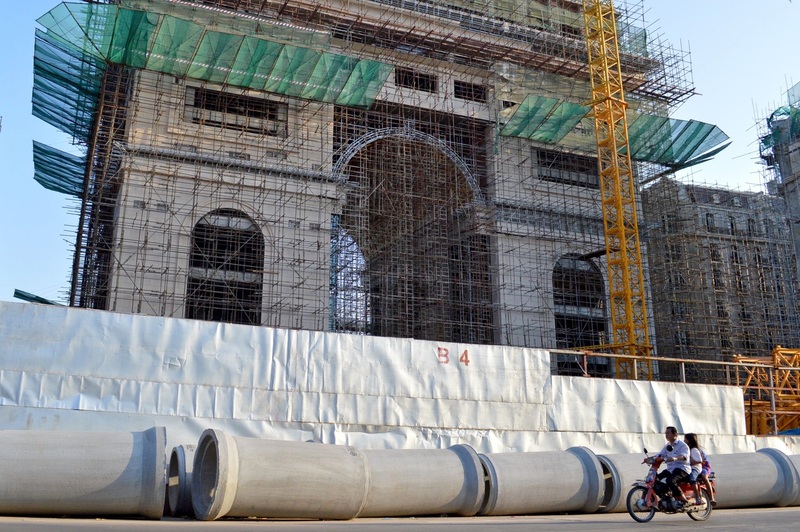 Phnom Penh has shuttled between those two extremes in the last five years. Optimism in the capital, an opposition stronghold, crescendoed in the aftermath of the 2013 election, when tens of thousands of city dwellers took to the streets calling for Hun Sen to step down. A 2014 political deal between the prime minister and his rivals diffused the movement, and the last few years—and especially last six months—have neutered it entirely. The government now frames the 2013 protests as a failed, US-backed attempt at a color revolution led by the opposition. With the CNRP gone, few outside observers expect a credible national election next year. State-affiliated TV stations have run footage of war drills in preparation for revolution and war, but there’s little sign of anarchy in the streets of the capital. Unlike the previous mass demonstrations, public protest has been limited to a farmer who was arrested for handing out leaflets outside the Supreme Court in November. Hun Sen’s bodyguards still laze in hammocks outside his house near Independence Monument, drinking beer and charging their phones. The city feels as calm as it has ever been. Bunthet sometimes takes his students on river cruises that skirt Koh Pich. He sees the island not as a model for the country’s future, but a cautionary tale. Ben Paviour is a freelance reporter formerly based in Phnom Penh, where he led politics coverage for the Cambodia Daily. Ben Sokhean is one of Cambodia's leading politics reporters and currently is on staff with the Phnom Penh Post.